Fharmonat https://www.zumub.com/images/large/fharmonat/fharmonat_slimlimao_duofibras_30comp_LRG.jpg 2FHA8519 Nie ma jeszcze żadnych recenzji. Have a question about Slim Limão Duo Fibras Linhaça? What is it, what does it do, how and when to use or something else? Ask us. 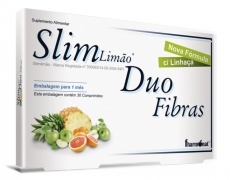 OSTRZEŻENIA Slim Limão Duo Fibras Linhaça : Please read entire label before use. Do not exceed the recommended daily dosage. Keep out of reach of children. Food supplements should not be used as a substitute for a varied and balanced diet and healthy lifestyle. Store in a cool, dry place. Please Recycle. BEST BEFORE: Please see lot number and expiration date stamped on the packaging.